Thursday may have signaled the official end of the off-season for the Pittsburgh Steelers when minicamp broke up and the players changed out of their practice jerseys and left the Southside facility. 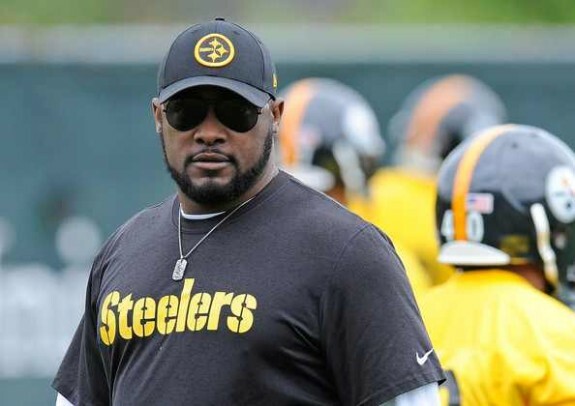 While NFL fans typically see the time leading up to training camp, which will begin July 25, at Saint Vincent College in Latrobe, PA, as ‘down’ time, head coach Mike Tomlin sees it as only the beginning. Note to veterans, rookies and those trying to make the final roster: stay in shape, learn your playbook and prepare mentally for what is to come. In other words, Tomlin and the coaching staff may have turned everyone loose for a break, but the hard work has just begun. One of the biggest responsibilities for players during this period will be a continuing conditioning regimen. Upon reporting to Saint Vincent, all players will be evaluated physically and must pass a conditioning test. While many players, like veteran safety Troy Polamalu, train during the entire off-season away from Pittsburgh before mandatory minicamp and training camp, many rookies tend to stick close to Steelers facilities in order to make sure they do not enter training camp on the physically-unable to perform list (PUP). Tomlin admitted that he did not anticipate any of the current members of the 90-man roster would be unable to pass the exams. Tomlin went so far as to say that he didn’t feel that the off-season is a true test. “It’s football-like,” he said, “and it’s a great opportunity to prove and learn and develop game cohesion and understanding.” It appears that coaching staff will expect far greater come training camp, and they will use it to not only evaluate performance but the other mental skills that players will need to fine-tune before then. While Stephon Tuitt looks to need a bit more time with the playbook, fellow rookie, first-round pick Ryan Shazier got the attention of plenty of veterans on the field. After getting physical with center Maurkice Pouncey, Shazier got vertical in front of backup quarterback Bruce Gradkowski, stealing the ball for an interception. Shazier has been taking snaps with the first-team defense since the opening of OTAs and it isn’t likely that the buzz surrounding his play will quiet anytime soon. Joey Porter’s addition as a defensive assistant was a serious investment in reclaiming a dominant Steelers defense. Although Porter said very little to the press or the players, linebackers coach Keith Butler said that Porter’s “barn-boss attitude” is still very much a part of his personality. While minicamp was an opportunity to get to know the players and where they need to improve, it would be hard to imagine Porter not being more vocal when he gets his defensive students onto the field in Latrobe and down and dirty. Second-year outside linebacker Jarvis Jones has shown that Porter’s mentoring has helped him reshape his attitude for the 2014 season and looks to come out at training camp as an even bigger force to be reckoned with. The no-huddle offense is going to be something that evolves, especially at training camp. Looking back at the 2013 season, the Steelers saw a lot of opportunities go in their favor when the no-huddle was used, and that was mainly due to the performance of Ben Roethlisberger and his orchestration of plays that worked. So far, offensive coordinator Todd Haley hasn’t bucked the idea – in fact, he looks to support using it more often. By adding Dri Archer and Will Johnson to the mix with Le’Veon Bell, the Steelers look to use either the run or pass without needing to substitute players so that opposing defenses do not have time to insert their own substitutions. With additional play makers in the mix, the Steelers could potentially develop a mid-series system that would keep defenses guessing and produce not only more-effective plays, but potential game-changers. The biggest highlight to such an offense would be getting better one-on-one matchups between receivers and opposing linebackers, rub-routes that create separation for a route receiver or even a blitz-stopping pass to an outlet from the offensive backfield. It isn’t trickery – it’s smart play calling and one that the Steelers will look to improve, but not completely revamp. Markus Wheaton is the projected number two wide receiver opposite Antonio Brown. At least, right now he is. Throughout the off-season, wide receivers were rotated in and out with the first-team offense. Despite a minor injury, Wheaton spent the majority of his time during the off-season with that first team and looks to lose his position on the depth chart only if he doesn’t keep performing at a high level at training camp. Roethlisberger found Wheaton during drills enough that Wheaton says he feels he is prepared physically and mentally. If the offensive line looked down-trodden during the 2012-13 seasons, they aren’t spending much time looking at their shoelaces this off-season. With Mike Munchak giving them the best possible coaching from his years of experience, the offensive line looks renewed, healthy and on the same page heading into training camp. Munchak has gained the respect of all of the front line and their communication and play has improved under his leadership. The Steelers Appear to Have Gotten Their Groove Back; Can They Maintain It? Be the first to comment on "Off-season wrap-up means time to work just got started for Steelers"